WELCOME TO THE 6TH GRADE QUARTER 1 PAGE! It is here that you will find continuous updates about what your child is doing in art this year! Learn about projects they will be doing, photos of in progress work and final work, links to our pinterest pages and more! ​For a brief overview of 6th grade art, click on the homepage! 6th graders have officially been introduced to their first project and we are so excited to get working!! Students were first introduced to the idea of design and learning about different types of designers and what they do. We then talked about a specific contemporary artist, Nick Cave, learn more about him here. 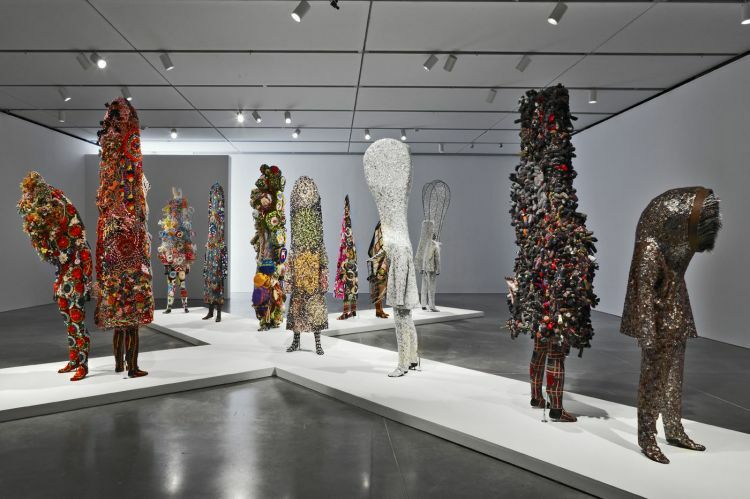 "Nick Cave is an artist, educator and foremost a messenger, working between the visual and performing arts through a wide range of mediums including sculpture, installation, video, sound and performance. Cave is well known for his Soundsuits, sculptural forms based on the scale of his body. Sound suits camouflage the body, masking and creating a second skin that conceals race, gender, and class, forcing the viewer to look without judgement." These Soundsuits have been our inspiration for the 6th graders new project which will be designing wearable art!! To check out more of Nick Cave's work as well as other artists who create wearable art, check out our pinterest page that we spent time looking at in class to show students the wide variety of wearable art that is out there! Maybe they want to redesign something that we already have in our world - like designing the next best spacesuit! There are so many avenues they could take with this project so we are very excited to see what comes of it! So far, students have first sketched individual ideas, then as a group, they shared their ideas with their group members and then were challenged to come up with one final idea for their entire group. They made sketches and began brainstorming what sorts of materials they might need for this particular project. We are so excited to keep moving with this project, next up, students will make mini models out of paper to begin troubleshooting their ideas. As we progress, I will begin to take photos of what students are doing and update here, so make sure to keep checking back for more info on our progress! 9/14: Making paper models of our ideas! To start our wearable art project, we are having students make paper models to start trouble shooting what the process of making it will be like. Some students ended up making life-size paper models and are realizing they will use their actual paper model as a base for their wearable art! Check out some photos of 6th graders making paper models yesterday! 9/22: Continuing to work on our wearable art! 6th graders have been hard at work in the art room, working on their wearable art pieces! Check out some images of their progress below! Apologies for not updating as often! My apologies for not updating the website nearly as often as usual! As you may have heard, the art department is currently working on a community wide art project at the Ottoson. Planning and executing the project has somewhat taken over our lives - in a good way! We are very busy working with the students at the Ottoson to make a BIG impact on our school, we are ready to take back our reputation and show everyone how accepting our community really is! Follow our progress with this project by visiting our Facebook page: Ottoson Inside OUT or following our instagram: Insideoutottoson! However - the 6th graders have been so great working in class on their wearable art pieces! A few groups have begun the finishing touches and most groups have begun to write their artist statements! We will be wrapping this project up over the next few days as well as introducing our new project! 6th graders will be introduced to their new project this week! First we will talk briefly about a new contemporary artist - Vik Muniz, an amazing artist who has inspired many of the Ottoson's art projects! 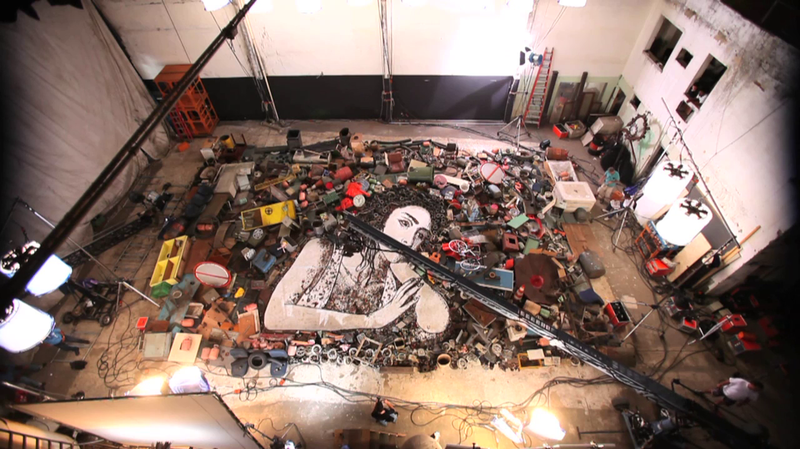 Vik Muniz's process is one thing that we are very fascinated with - his work with assemblage art in particular. We will be showing students several images of his assemblage work in reference to a project he did in Brazil several years ago - learn about the project here. The project is very inspiring and you may be interested in watching the documentary about it called, Wasteland, see a clip for the movie here. 10/7/16: A practice project on value and assemblage! Before we dive into making our own Vik Muniz inspired assemblage collages of photos of our choice, we first did a practice project to learn about discerning values and also about assembling materials in a way that will still show the form of the image we are creating! Check out some photos of students working on their paper value practice projects! 10/11/16: Making progress on our new project! Now that most students have finished their paper value practice project of the sphere (shown above) they have chosen a photo that they would like to create their mini assemblage mural of and have moved on to learning about contour line drawing. In preparation for this project, students first learned about contour line drawing and each did a practice drawing of a "ugly pumpkin." This was an important step in preparation for this mini assemblage mural project as students will be drawing their photo onto 11x14" paper to then work into with assemblage materials. They won't be creating full on renderings of their photo, they are just focusing on the contour lines - mapping out where everything is in the photo and paying attention to keeping the proportions since they are scaling up their image. To learn about keeping proportions correct when scaling up a photo, I showed them a few tricks about grinding your image and making guidelines on our paper so we can figure out what goes where. Students have been doing a great job! Once they have drawn their image onto their final draft paper, they will then begin to collect materials to assemble into their drawing! Check out some of the awesome images students will be working from! The only requirements for the image was that it must have value and an interesting composition. 11/2/16: Nearing the end of the term! 6th graders have made SO much progress on their assemblage collages, check out the work they have put in, some have finished and others are nearing in on the end of this project. We will end with a painting project which you will hear more about soon!